How do we produce the next Matt Ogden, Lizzie Ingham or Tim Robertson? How do we capture the huge amounts of raw talent we have at a schools level and carry this success through to JWOC and then onto WOC? These are the sorts of questions that we need to be asking ourselves over the next few months, particularly with the formation of the new Junior Committee and the continuing development at a High Performance level. Two organisations I think we could learn a lot from, in terms of what they’ve done to address these questions, are Canada and Australia, both countries that are comparable to Orienteering New Zealand with regard to how they’ve worked with limited resources. Over the last few years both Australia and Canada have put a lot of effort into developing plans and pathways that will (hopefully!) result in better performances on the world stage for their athletes. Both were supported by their National Sporting Bodies, the Australian Institute of Sport (AIS) and Sport Canada, which produced a template document to be adapted for use by all sports. Although orienteering has quite differing requirements from say, rugby or athletics, in both cases the template produced is broad enough to be usefully co-opted. In Australia the Athlete Development Pathway forms the basis of their impressive new High Performance Plan, the link to which is at the bottom of this post. 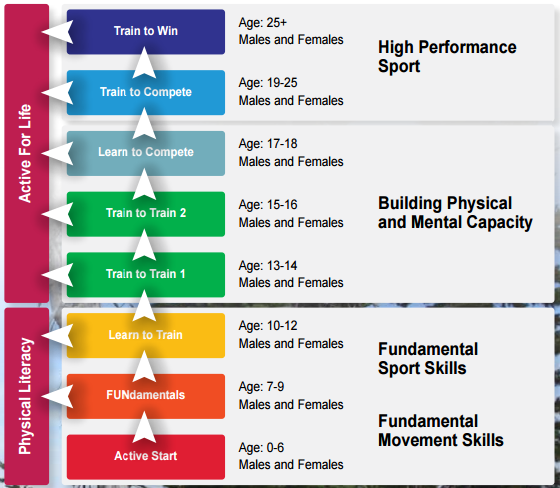 The pathway is based around the Foundation, Talent, Elite, Mastery (FTEM) process that was developed by the AIS. 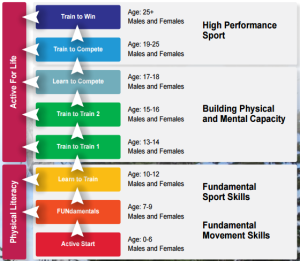 At the beginning Foundation Levels are based around learning fundamental movement skills at an F1 level through to regularly competing at club events and attending coaching sessions at an F3 level. 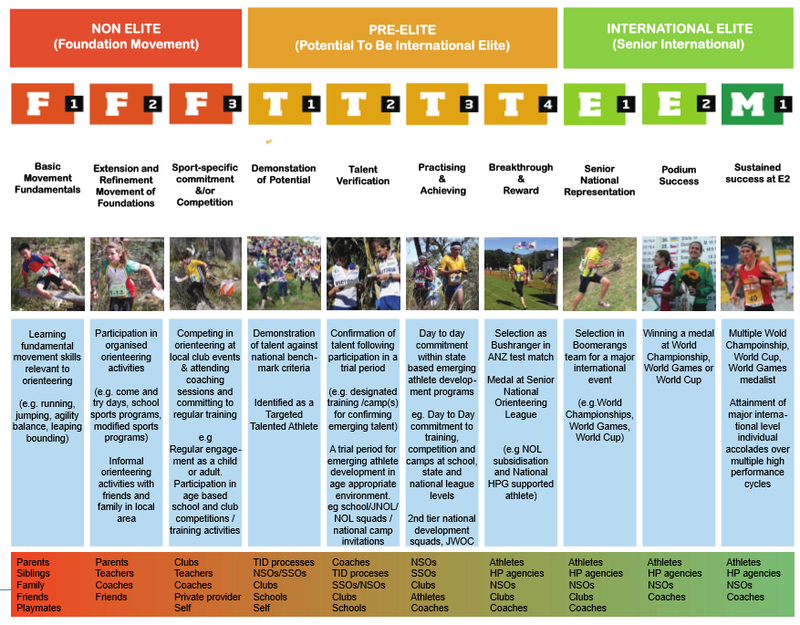 It is easiest to imagine this applying to a Junior orienteer progressing through the ranks, however the pathway is also designed to be equally applicable to an adult who has just begun orienteering, and Australia has done well at recognising this with, for example, their Senior Development Squad. Personally I think this is a step in the right direction. 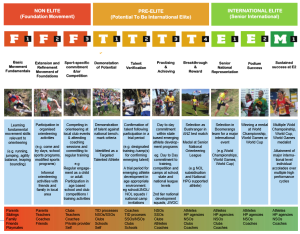 A holistic view must be taken in order to create a series of achievable steps to becoming an elite orienteer, and Australia has rightly identified their Junior Program as an area that needs work. In New Zealand we almost have the opposite problem, the work of several individuals and clubs has resulted in an extremely strong level of competition at a schools level but as of yet this has not been carried through to a senior level. Canada has also developed a plan that is very similar to Australia in that it identifies a number of steps from Fundamental Skills through to High Performance Sport. To highlight a couple of key differences it identifies orienteering as a late specialisation sport so athletes won’t be peaking until their mid-20s. Therefore they have explicitly attached ages to each step in the pathway. Ultimately, when we are supporting and investing in athletes at all stages of the Athlete Development Pathway, we are not only enabling more top elite performances, we are also helping the growth of our sport. When we provide opportunities for individuals at all levels to develop their orienteering skills in a fun, social way, we increase the retention and conversion rates and people will continue to participate in orienteering whether this is at a competitive elite level or a recreational ‘Sport for Life’ level.